Get healthcare lien resolution and complex settlement administration updates, trends and must have information in your inbox weekly. For years, there has been debate on the subject of Medicare Set-Asides (MSAs). Are they required or not? How do you calculate them? When do you have to ask the federal government to review and approve them? While MSAs are one option to help parties comply with the Medicare Secondary Payer (MSP) Act, they are not the only option. Rather than asking “Is an MSA required?” the settlement community would be wise to focus on what the statutory obligation actually is and always has been. While the Medicare Secondary Payer provisions never mention the term “Medicare Set-Aside” or “MSA” in the statute or regulations, it does prohibit Medicare from paying for future items and services where a primary plan or payer has accepted responsibility for those same items or services. Thus, the critical issue becomes identifying whether the settlement award contains proceeds that compensate the claimant for some or all of those future injury-related items or services. If it does, then the claimant should make sure Medicare is not billed until that compensated amount is spent down appropriately. While an MSA could be one tool to ensure that occurs, it’s not the only way. In fact, the growing trend is for parties resolving workers’ compensation claims to develop and implement a non-submit MSA program with a partner whose conclusions and assurances serve to substitute in full for the federal government’s approval of your MSA figure. John Cattie, our MSP Compliance Subject Matter Expert, will be speaking to the Workers’ Compensation section of the North Carolina Bar Association on Thursday, February 4th at 10:15AM at the Grandover Resort in Greensboro, NC about these future medicals issues. Attendees will walk away with a clear understanding of the future medicals obligation under the MSP statute and regulations as well as why a non-submit MSA program may make a lot of sense for those parties wishing to avoid the time and expense of seeking approval from the federal government. We hope you can join him. 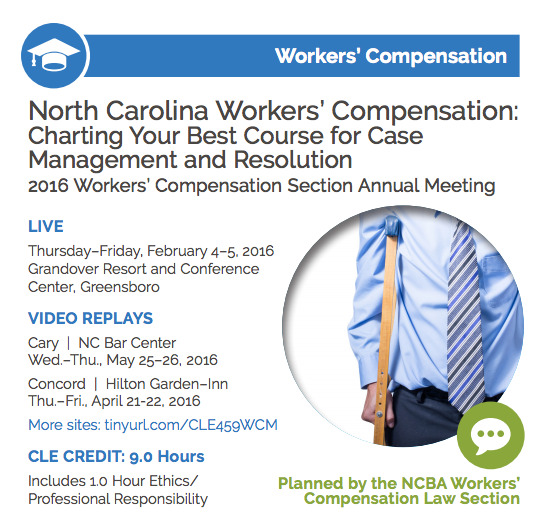 Click here for more information about the NCBA Workers’ Compensation Annual Meeting.